Bret Mercer, Madera Store Manager. Qulaity Machinery Center Farm Bureau Member since 2009. Quality Machinery Center has only been serving the farmers of Madera County for about a year and a half; we have been serving farmers in Kings and Tulare counties since 1980. In the Madera County we are the authorized dealer for Massey Ferguson, Weiss McNair, Domries, Bush Hog, D&M Sprayers, Darf, Loewen, Krause and other short-line manufacturers of farm equipment. Most recently, Quality Machinery Center became the Madera County dealer for Kawasaki Engine / Power Products. Are you part of a family owned business? Quality Machinery Center was founded by Darrel and Debra Boling in 1980. When Darrel passed away on April 15, 2005, Debra was approached to sell out but she has always wanted Quality Machinery Center to be a family run business. Debra continues to own and operate four locations with Brian Potter as General Manager. Madera native Bret Mercer serves as our Store Manager, being on the Madera Chamber of Commerce Board of Directors, he is involved with all types of community projects. Our Madera location is leased from Mrs. Eleanor Newcomb, primarily serves farmers and dairymen as well as small acreage homeowners. Our Madera Store is currently our smallest volume store, but we believe it has the potential to grow into one of our larger stores. 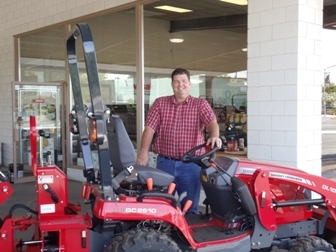 Bret Mercer knows, if needed, he can draw upon the resources of our entire organization to provide the highest level of equipment, parts, or service required in the Madera area. Yes, water issues are primarily the federal and state government’s failure to provide additional water storage and will continue to affect our customers not only in Madera County, but throughout the whole San Joaquin Valley. Farm Bureau in regards to being a dealer, they are one of the best allies we can have. When it comes to legislation and regulations that are being implemented through our Federal and State Governments Agencies, Farm Bureau keeps all parties of interest informed farmers, dealers and concerned members.